It’s amazing how dishes are created out of necessity. The necessity of using the ingredients you have, whether because of what’s in the market or because of what’s in your fridge. Today I had planned to make rollatini, eggplant rolled and stuffed with ricotta cheese. My grandmother always made eggplant parmesan, but I always thought that was a lot of work. You can get the same taste by making the ricotta filling, stuffing the eggplant slices, and topping with a nice marinara sauce and cheese. This afternoon I started the process. My eggplants were small and when I sliced them lengthwise, they were a bit uneven. So after cooking them in the oven at high heat for 5 to 10 minutes, I decide to leave them flat like my grandmother’s lasagna. While I was making the marinara sauce, I realized I had some left over lamb burgers and some roasted red peppers from the night before. 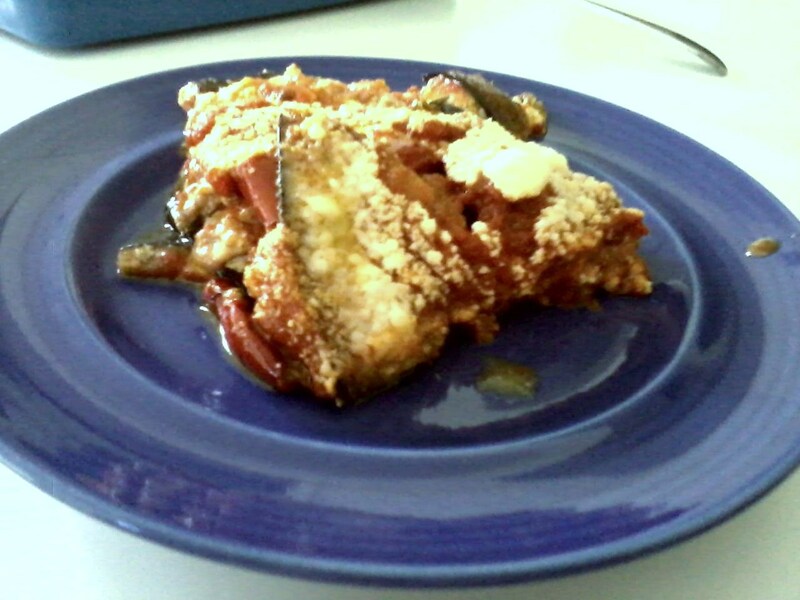 I decided to layer the eggplant, the ricotta mixture, and the lamb and peppers, giving the dish a Greek touch. My grandmother always used already cooked meatballs in her parmesan, so using already cooked lamb burgers crumbled up was not such a stretch. The result? As you can see it looks great. And it was delicious. What shall we call it? A Greco-Italo moussaka parmesan? Or maybe just Mom Boya’s eggplant?